Skunks are an unwanted guest to have wandering around your yard or nesting under your home. They pose a danger to your family and can cause foundation damage when they dig to get under your house. You may notice that skunks get less active during winter, but this does not mean they are not around. With the cold season coming to a close, here’s what animal control pros want you to know about these local critters. What Do Skunks Do in the Winter? Skunks do not hibernate in the winter, but their level of activity is significantly reduced. They will eat a lot more food throughout the fall, bulking up so they can stay warm through winter temperatures. They’ll spend as much time as they can huddling in their den for warmth. They may even burrow in with another skunk to share their warmth, and they’ll block off the entrance to their den with leaves to reduce air flow. While they will slowly metabolize their fat each winter, they will still occasionally leave their den in search of easy food. Skunks will look for a convenient location to create their winter dens. Some popular spots include in your crawl space, under decks, in your basement, under sheds, or in wood piles. Sources of food will also attract them, such as pet food left outdoors, or an unsecured trash can. To keep them off your property, seal off all easy den locations, such as entrances to your crawl space with chicken wire. Secure lids on your trash cans and don’t leave any food outside. 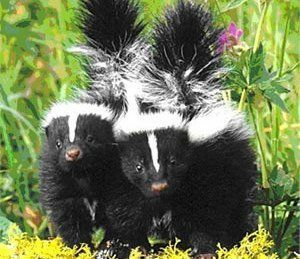 If you think you have a skunk problem, call an animal control service to remove them. Based in New Milford, CT, American Bio-Tech Wildlife Services provides ethical and effective animal control services across the state. They use a three-pronged approach to wildlife control; this involves preventing pest problems, handling home animal removal, and taking steps to keep them out in the future. Learn more about their humane animal control services on their website and call (860) 355-1231 if you see a skunk on your property.